Bowling Alley with Comedy Club, night club, and card room Bowling alley with game room. Full service snack bar and lounge. Comedy shows every Thursday, Friday and Saturday. Video jockey dance club Thursday, Friday, and Saturday starting at 10 Pm. Mini-Casino with blackjack, poker and other Reno style table games. Candlepin Bowling at its best, in a clean smoke free environment. Come in with the family for public bowling, or check out their full schedule of leagues for all types of bowlers. Bowling, billiards, laser tag, birthday parties and more! CELEBRATE YOUR HIGH-FIVE MOMENTS, RIGHT HERE When you want to let your fun out with family and friends, Main Event is the best - and easiest - place to HEAD FOR FUN. 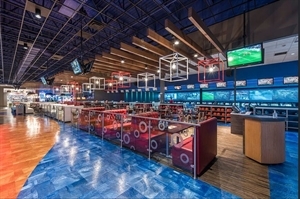 Upscale Family Fun, LaserTag, Arcade, Bowling, Gourmet Pizza 24 lanes of bowling, two-story laser tag arena, huge arcade, specialty pizzas. Full service Kingpin Restaurant, daily specials. Friendly service. Check out our website for daily specials and party packages. 28 state of the art bowling lanes, chef inspired restaurant PINSTACK is a unique dining and entertainment destination. The one-of-a-kind 50,000 square foot venue features a full-service restaurant offering a chef-inspired menu featuring local and regional cuisine, a full bar and private dining area. Open Bowling, Leagues, Parties & Special Events, Great Food! Plano Super Bowl is your family, neighborhood bowling center. Frederick's only 10-pin bowling center. Frederick's only 10-pin bowling center is first in family fun. We have 36 lanes, snack bar, full bar and video games. An affordable way to make sure everyone has a great time. We offer open play as well as lane rental specials. 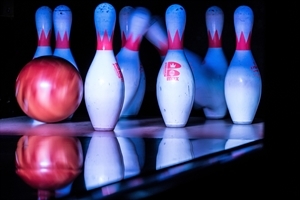 Chalet Lanes is the family fun center in Wisconsin Dells, featuring Rock & Bowl. How about bowling? The Chalet Lanes is the family fun center in Wisconsin Dells. Featuring Rock & Bowl (16 lights, sound system & fog machine), automatic scoring, game room and bumper bowling for the kids. Serving sandwiches, pizza & lunch specials. Springfield's largest bowling center is a complete family fun center and home to the Greater Ozarks Open. Check out the recent addition: The Back Alley Bar & Grill, a full service restaurant. Springfield's largest bowling center is a complete family fun center and home to the Greater Ozarks Open. Check out the Back Alley Bar & Grill, a full-service restaurant. No matter what the day's forecast calls for Knuckleheads Indoor Amusement Park is your answer. Come visit Wisconsin Dells' newest entertainment & dining facility, Knuckleheads Indoor Amusement Park and Buffalo Phil's Grille. Knuckleheads will provide year-round family fun - rain or shine in our non-smoking facility. Twenty-four lanes, video games. Open M-Th, 9am-11pm; F-Sa, 9am-1am; Su, 11am-11pm. Bowling, Movie Theatre, Arcade, Skating, Food, Parties 20 lane bowling center with automatic scoring, billiards room with 7 tables, 8-screen movie theater with stadium seating & 3-D digital movies, roller skating rink with DJ, arcade with redemption games, restaurant, bar, party rooms, and banquet facilities.